The Panzerkampfwagen IV was Germany's most important tank during the second world war. It remained in mass production throughout the conflict, with more than 8,000 units being produced. This represented more than one-third of Germany's total wartime tank production. 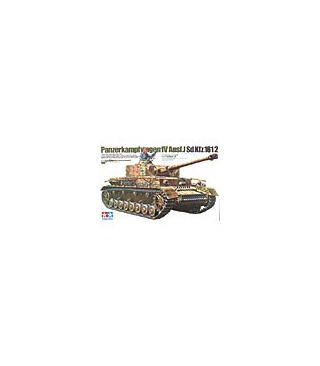 It was the backbone of the Panzer Divisions and it was often referred to as their "Workhorse" The Pz.Kpfw. IV underwent constant improvement throughout its long career. As an example, its original short-barreled 7.5cm main gun was replaced with the long barreled 7.5cm KwK40 L/43 gun beginning with the Ausf.F2 version. The further improved 7.5cm KwK40 L/48 was added to the Ausf.H onwards. In 1944 however, with the introduction of the new Panther and Tiger tanks, plus other tactical considerations, the Pz.Kpfw. IV began to serve mainly in a defensive capacity. A need was required to simplify construction and increase productivity, plus conserve scarce raw materials. The last of the series, the Ausf.J thus had a much simpler construction, and an extra fuel tank replaced the auxiliary engine/generator. This greatly increased its range from 210km to 320km and was welcomed by the German troops, as they were having difficult with their supply, but it was attained at the expense of electric power for the turret traversing motor. The thin steel plates known as Schurzen (skirts), first introduced with the Ausf.G, were sometimes replaced with heavy gauge wire mesh, or not even used at all.